Tips and techniques on the performance and usage of the illusion. This 15 page e-book is jammed full of information, tips on presentation, safety, routine ideas as well as step by step coverage of the best way to perform this illusion. This is one of the only books in the history of magic devoted solely to helpful information on the performance of this classic illusion. Find out how to add this illusion to any show and to add value to your client in the process. This illusion has been a classic of magic and can add tremendous value to your show at a fraction of the cost of some of the larger illusions out on the market today. It can be set up quickly and transported with ease but always amazes audiences of all ages. 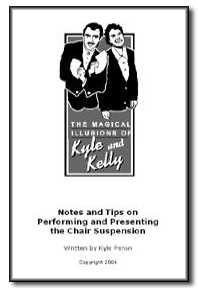 If you own the chair suspension or are even thinking about getting one, this E-Book is a MUST!